High Sierra isn’t a glamorous update to the macOS, but it’s one that sets it up for the future. Operating system updates can be an exciting time for users. There’s the potential to be more productive with new apps, interface enhancements that make your computer easier to use, and flashy new features that remind you how much of an impact technology can have on your life. If you want to get caught up in the excitement of an OS update, you should read Jason Snell’s iOS 11 review. iOS 11 is where all the action is right now. With macOS High Sierra (version 10.13, if you’re keeping track), life on the Mac doesn’t change dramatically. It doesn’t have a lot of new features that will widen your eyes in excitement. But a lot of the changes are in the background and under the hood, and they lay a foundation for better things to come. With that in mind, let’s address the main question right now: Should you upgrade to macOS High Sierra? Despite what I just said about better things to come, there are several new features you can take advantage of now, mostly in Apple Photos. (I’ll provide an overview of the new Photos, but there’s enough happening in the app to cover in a separate article—which we'll post soon.) Apple’s Notes and Mail apps get a few helpful tweaks, too. So there is something in High Sierra to get your virtual hands on. But these are things you don’t need to get to right away. If you want to put off upgrading to High Sierra, that would be fine, you won’t miss much—though the main reason to upgrade now is because High Sierra includes security fixes. Other than that, these are changes in High Sierra that you’ll want to have sooner or later. Then you’ll finally get to see though fireworks—perhaps in virtual reality. APFS (Apple File System) is the key under-the-hood feature of macOS High Sierra. Computers needs a file system in order to manage your data, and until now, that file system was HFS+ (Hierarchical File System). 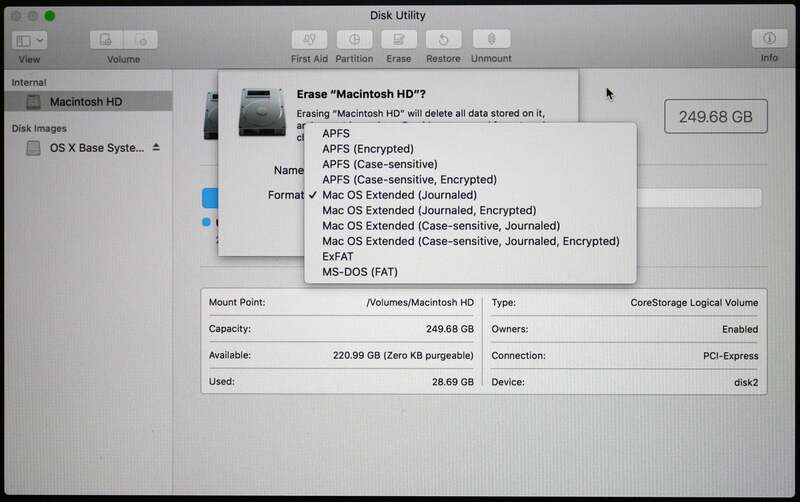 APFS is available when you format a drive in Disk Utility, but it’s currently only for SSDs. APFS was created because HFS+ was outdated—it was created in 1985. Storage devices are much bigger now, and we create more files than ever (just take a look at your photo collection if you need proof). Developers have been aching for a new file system for a while, and Apple has finally answered their prayers. There’s a catch, though. APFS, right now, is only available if you’re using flash storage or a SSD (solid-state drive) on your Mac. During the beta run, APFS could be installed on a hard drive or Fusion drive, but that support was pulled when High Sierra reached golden master status. Apple said that hard drive and Fusion drive support will be available in a future macOS update. The ability to better manage very large storage capacities and files. When you upgrade to High Sierra, the installer asks you if you want to upgrade to APFS, if you’re using a Mac with a SSD. I didn’t experience any problems that I could attribute to APFS while I used the High Sierra beta, but that doesn’t mean they won’t happen. With APFS released to the general public, it’s possible new problems could arise. This possibility would be the main reason why you might want to wait to upgrade until the first major High Sierra update is released. Virtual reality has made a lot of noise in the PC market, but you haven’t heard much about it for the Mac. 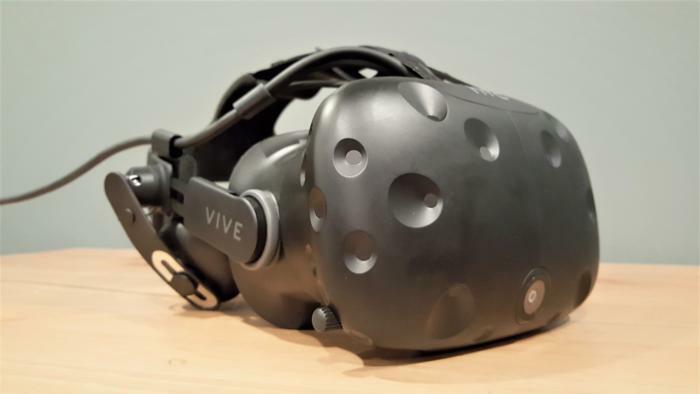 Apple hopes that changes with High Sierra, which now has support for VR headsets like the HTC Vive. Apple also has VR partnerships with Valve, Unity, and Epic, and plans for 360-degree video in Final Cut Pro X and Motion. macOS High Sierra has built-in support for VR headgear like the HTC Vive. High Sierra also includes support for Metal 2, Apple’s graphics API. In addition to support for VR and better performance, Metal 2 has support for external GPU hardware, which could mean you can boost your MacBook’s graphics performance by using Thunderbolt to hook up an external box with a top-end graphics card. You may not be able to take advantage of VR and Metal 2 support right away, though. Developers need to create Mac-compatible VR software, and software needs to be developed for Metal 2. Down the line, we could see some really cool stuff. Apple has two new file formats that actually debuted in iOS 11: High Efficiency Video Encoding (HEVC) is a new format for video, and High Efficiency Image File Format (HEIF) is a new format for photos. HEVC, also called H.265, offers smaller file sizes than the previous standard video format, H.264. Smaller file sizes are important, since we’re now living in a world of 4K video—and if you've ever made a 4K video on your iPhone, you know that the files can get pretty big. HEIF does a similar thing: it makes file sizes smaller than compared to JPEG compression. 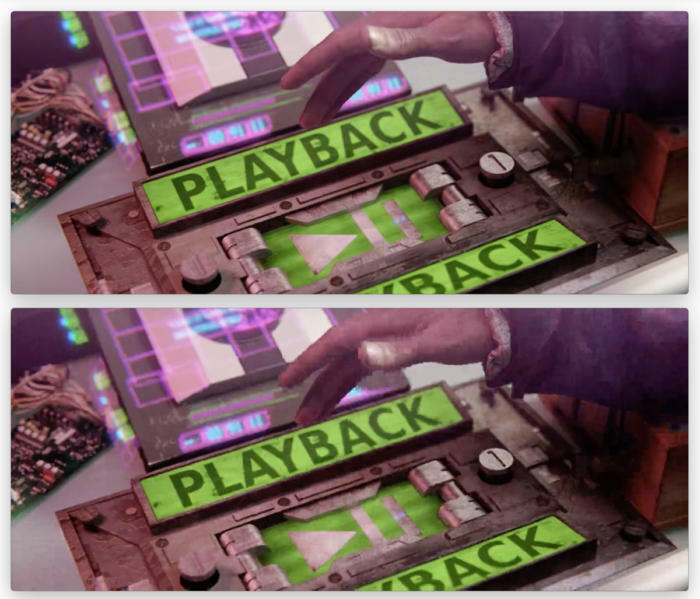 Both of the videos in this still image were encoded at 1080p at 400 kbps. The top video (706KB file) used HEVC (a.k.a. H.265). The bottom video (751KB file) used H.264. Click to enlarge. Sample files available at x.265.com. With support for these formats built into High Sierra, you’ll be able you read the HEVC and HEIF files from your iPhone (provided that you have one that can create HEVC and HEIF files). Macs with a Skylake processor or newer will be able to provide hardware acceleration for HEVC; Macs with an older processor can still play HEVC, but playback is software-based and performance may be affected. Sometimes it can be scary to use new file formats, especially when the new formats replace ones that are ubiquitous. You can decide to not use the new formats on your iPhone, as explained in our overview of iOS 11. HEVC and HEIF do offer significant benefits, and Apple has made provisions to make sure you can export your HEVC videos and HEIF photos into H.264 and JPEG, respectively. Finally, something in High Sierra you can really get your hands on: new Safari features. There are several new features in Safari 11, but there are a couple that stand out. The first is control over media auto play. You know those annoying auto-play videos that appear when you visit a website (like Macworld.com)? 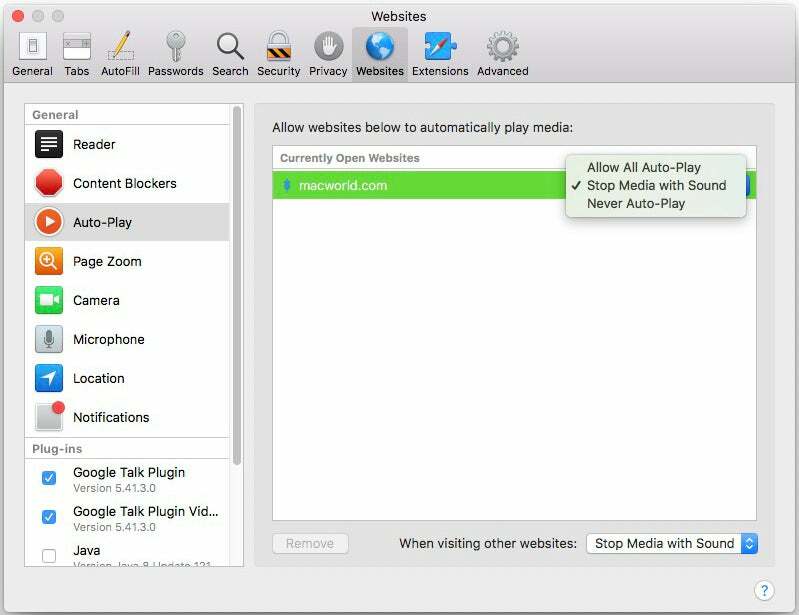 Safari 11 now gives you the option to stop those videos from automatically playing. Or you can let the video play, but mute the auto. You can create a list of websites with each site having its own settings. With auto-play videos so prevalent on the web now (despite the widespread dislike of them by users), it’s a feature that’s long overdue. We have details on how to adjust the auto play media settings in a separate article. Safari 11 allows users to stop auto-play videos in their tracks. The second feature is Intelligent Tracking Prevention. Tracking is used by third parties to aim their advertising at you. The most obvious example of this is when you buy something on the web—say, a salad spinner—and then when you visit other websites, you see salad spinner ads all over the place. ITP prevents this tracking from happening, so you’re no longer creeped out when you’re on the web after shopping. This is another great feature, and you can use our step-by-step instructions to properly activate it. Safari has a bunch of other cool features, like an always-on Reader mode, persistent page zoom, notification controls, and improved performance. Excited about the Safari 11 features? You don’t need to upgrade to High Sierra to get them. Safari 11 is also available for macOS Sierra; you can install it by performing a software update. If you want to wait to upgrade to High Sierra, you can still get Safari 11. Macworld’s Mac 911 column fields support questions from you, the reader. About 20 percent of the questions we get are about Apple’s Photos app—sometimes it’s a lot more when a new version is released. So I think it’s fair to say that Photos is popular, but people wish it were easier to use. Photos is the one app in High Sierra that gets the most changes, and those changes make it a better app. It’s a better organization tool, with tweaks to the sidebar and toolbar, drag-and-drop organization, imports history, improved accuracy with the People album, and more. The Edit mode is redesigned with better access to tools, Live Photo support, and there are also new filters. Photos also has new Project Extensions, so you can use third-party services to create websites, books, and other goods. The changes and new features in Photos are too numerous to go into any great detail in this review. Instead, we’re going to dedicate a whole article to the new Photos. Look for that in the upcoming week, and we’ll updated this review with a link to it. 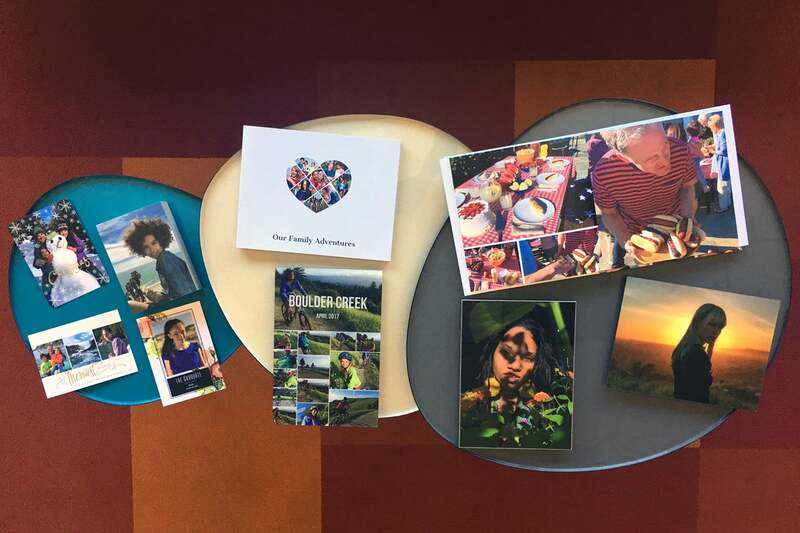 Photos’ Project Extensions allow you to create photo books, cards, mounted pictures, and more directly in the Photos app. Siri made its debut in macOS Sierra. I don’t find myself using Siri nearly as much as I do on my iPhone; that’s just the nature of how mobile devices are used versus laptops and desktop computers. In High Sierra, Apple has improved Siri by making it sound less robotic and more like natural human-speak. It’s a very noticeable change to me, and I guess there are folks who appreciate it. But Siri’s robotic expression never bothered me, and I really don’t think this is a big deal. I have never once thought, “You know, I’d use Siri more if it sounded more like a person.” Below is a sample of how Siri now sounds. What prevents me from using Siri more is that I consistently have a hard time trying to get Siri to understand me. To this day. I still can’t get Siri to regularly understand me saying, “Send a text to my wife.” (And I have to use “my wife” because Siri always misunderstands my wife’s last name, and I have multiple contacts with the same first name.) I know I have a terrible voice, and my annunciation needs work (I’ve been told this for years by various professionals), but even if I try my hardest, Siri misunderstands me more often than anyone would like. Since this issue for me hasn’t gotten better, I have to believe that Siri has reached peak comprehension, so I need to change. And I’ve tried, but the only real change I’ll probably make is to not use Siri. I’m not saying you shouldn’t use Siri on a Mac. There are big fans of Siri and it works well for them. You’re lucky. You’ll be able to take advantage of Siri’s new integration with Apple Music. Say, “Play some music” and Siri will play songs, and if you want to skip a song, you can say, “Play next” and Siri will play the next song. You can even tell Siri to play specific genres or artist, and even ask for some background information, like “When was this song released?” Have fun with that. The Top Hits feature in Mail displays how much you’ve read an email, past searches, and a message’s relevance to VIP or Favorite contacts to make it easier to find what you need. 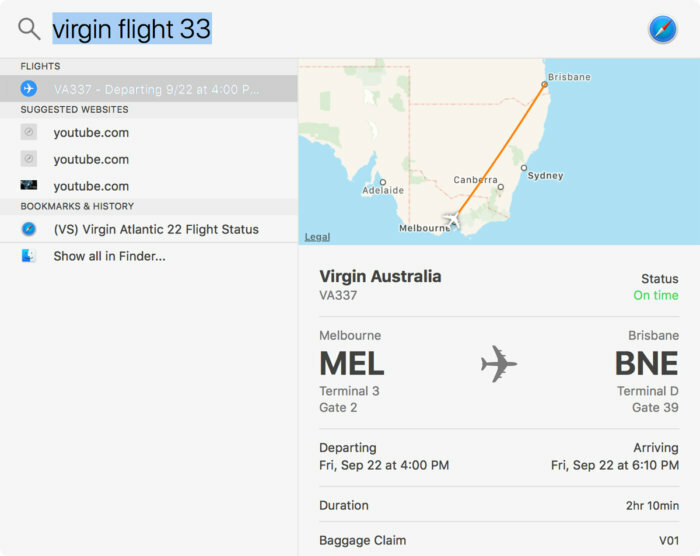 Spotlight search now can provide flight status. The iCloud setting in System Preferences has been redesigned so you can manage your Family Sharing. MacBook Pro users will find TouchBar improvements. The Notes app now has support for tables and pinned notes. Spotlight in macOS High Sierra can access flight information, so you don’t have to bother with Safari and going to your carrier’s website. 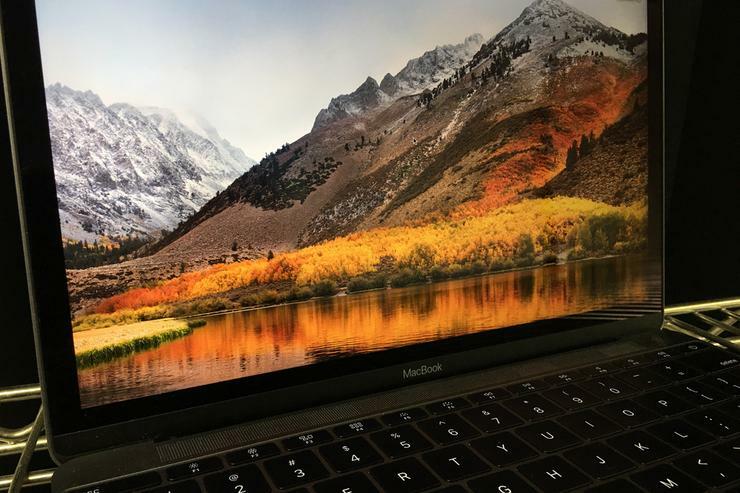 macOS High Sierra may not be chock full of juicy new features you can’t wait to use, but that’s OK. What’s more important here is that Apple is setting up the Mac for the future, with APFS, Metal 2 and virtual reality, HEVC and HEIF, and more. If you want to put off upgrading until the first or second major update, that would probably be fine, though consider that upgrading now will install important security updates. Regardless of how you view the new features, the future of macOS looks bright. You’ll need to your Mac to be up to speed to take advantage of it all.